Wooden bow ties make wonderful gifts! 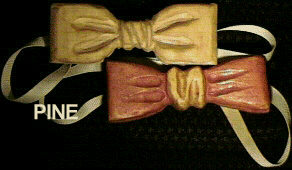 Each wooden bow tie is sculpted from choice, select wood; either solid or pieced into interesting designs. Each tie is hand made and signed by prize winning sculptor - Marv Beloff. No two wooden bow ties are alike! They are carved to suggest folded and tightly pulled fabric. The finish is natural. The object is to fool the casual observer. It comes to you beautifully boxed and carefully shipped at no extra cost. Guaranteed to please! After wearing your bow tie you will understand why members own two or three in different woods and colors. Browse Our Bow Ties! These wooden bow ties have been auctioned at charity events for more than $300.00. from $49.ea. Marv Beloff has been selling wooden bowties online for over 20 years and has created custom bowties for customers all around the world. A tie purchase, (includes: a money back guarantee, club membership and beautifully packaged wooden bow tie.) With your membership,( if you wish ) we will place your name and or picture wearing your tie, in the photo gallery. "At a dinner party recently, I was sitting down for the soup course and automatically pulled my hand to my chest to keep my tie from once again falling into the soup. Fortunately, I then realized that I was wearing my wooden bow tie and didn't need to worry about this ever happening again. Now I realize the true value of my wooden bow tie. Furthermore, even if I should accidentally fall into the soup, it would keep me afloat until help arrived." " I never really wore ties much. Never wore bow ties. But, these are a hoot! I wear them everywhere." "My wife loves mine and, her "splinter group" pin." If you are unhappy with your tie in any way, simply return it for a prompt refund or exchange.